While video games may seem like an activity that is meant strictly for younger generations, there are more and more seniors who are turning to the gaming devices for a source of unparalleled fun and entertainment. Here are just a few of the surprising senior health benefits that can come from a little video game play. Video game systems such as the Wii are a great way to promote healthy exercise. Plus, seniors can play these physical games either on their own or with friends and family members. From tennis and boxing to bowling, golf and dancing, there are all different types of Wii video games out there that can promote healthy exercise in seniors. In fact, more and more assisted living facilities and retirement homes across the country are adding Wii counsels to their activity rooms as a fun way to promote healthy exercise among their residents. Any activity that helps seniors improve their memory is important. Researchers at UC San Francisco found that video games designed to improve cognitive control can actually improve the mental function in seniors and improve their memory and sustained attention ability. While seniors may be one of the most at-risk groups for depression, a study at the Sam and Rose Stein Institute for Research on Aging at the University of California actually found that seniors who play entertaining video games that combine both play and exercise actually have improved mood, mental health, and decreased chances of depression. A study published in the Journal of Gerontology from the University of Illinois at Chicago actually found that seniors who play computer games had better balance than seniors who don’t. Improving motor skills actually helped these older adults maintain better walking speed and better overall balance, important skills for the senior community that is impacted by millions of fall-related injuries every year. The wildly popular shooting games that so many young gamers play, can actually help seniors improve their overall vision. In a 2012 study in Seeing and Perceiving, a study found that these first-person shooting games can actually help seniors with cataracts improve their vision. 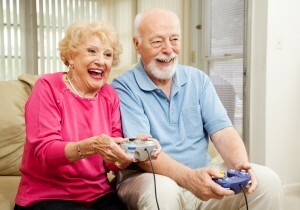 For seniors who want another way to relate to their grandchildren, video games are a great tool to consider. This can give grandparents something new to do with their grandchildren and a new topic to discuss as well. While it may sound a little out of the box, seniors should now no longer just look to video games as something for their grandchildren, as there are some really great and surprising senior health benefits that come with playing these virtual games. Plus, they are fun mood-boosting ways for seniors to spend their days. Video games should no longer be seen as mindless activities that take up kids’ free time. When played correctly, the right video games can actually provide a great deal of cognitive stimulation and help seniors live happier, healthier lives. What is more fun than that?